Ae you considering homeschooling your children? While there is more information out there about homeschooling than ever before, you may not know where to start. 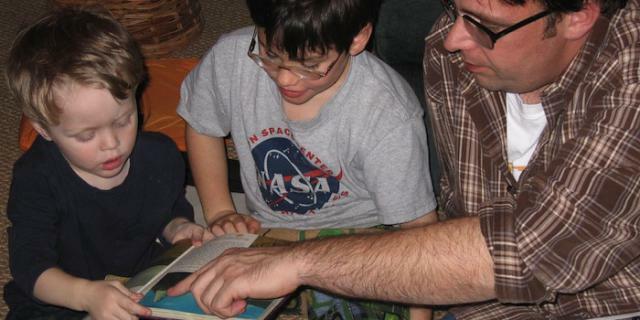 So let's take a look at homeschooling, from a beginner's perspective. "Homeschooling" in a legal sense means that one or more children of not more than 2 families are instructed by parents or legal guardians, or a member of either household. The laws that define homeschooling vary from state to state, and country to country. If you have ever had a baby or toddler, you've already homeschooled--you just didn't know it! Learning begins long before kids reach school-age. Many children already know their alphabets, the names of animals, colors and other more complicated stuff before they reach school. And who taught them? I'm betting it was you. Homeschooling is just a natural progression from there. Instead of sending your child to a public school, you make or buy your own curriculum and teach in ways that best suit your child. This, put simply, is what homeschooling is about. Here's what to consider before you make the decision to homeschool. Meet other homeschoolers. Find out the pros and cons of homeschooling from their perspectives, and what the local resources and issues are. Often there are local support groups you can join. If you are not considering homeschooling for religious reasons, be sure to check whether a group takes religion into consideration for membership; in homeschooler lingo, a group that considers your religious beliefs your own business is called an "inclusive" group (guess which camp I'm in). Work out your budget. Homeschooling costs whatever amount you want to devote to it. If you only have a couple hundred dollars a year for it, then that's your budget for homeschooling. You'll have to be more creative than someone who has a couple thousand to spend on a canned curriculum, but it's very possible to homeschool for little or nothing--as long as you have two things. You need a good internet connection and a good local library. And even if you don't have the latter, you can still make do with the former. Enchanted Learning: While much of this site is available for free, a membership of only $20 a year gives you more resources than you'll be able to use! Printables, work sheets, craft ideas and so much more. It's some of the best money I spend on homeschooling all year. A to Z's Home's Cool: Lesson ideas, links to other sites and more, with seasonal recommendations. Ambleside Online: This is a site for religious homeschoolers who follow the teaching philosophy of Charlotte Mason, but as a secular homeschooler I find it easy to adapt (and I find in my own reading that Miss Mason herself would have been fine with a non-Christian using her methods). This is a complete curriculum outline for homeschooling that you can use as-is for almost nothing. There are many pre-made curricula out there, for both religious and secular homeschoolers, at many different price points. You can find some curricula used on eBay, but many companies have convinced eBay not to allow their teaching manuals to be sold. Becoming part of a local or even national support group can often yield deals on used curricula and other materials. Build your self-confidence. Are you qualified to take on homeschooling? My own answer is yes; I don't care what your own level of education is, and most states don't care either. Teaching is a continuation of your own learning process. You will learn along with your children, and what you don't know you can either learn alongside or find help. There are many enrichment programs available out there--remember, many areas don't have art or advanced science programs even for public-schooled kids, relying on private enrichment programs, and you can take advantage of those as well. And often when your child reaches a certain age she can qualify for early entrance to community college, where she can take all the calculus, chemistry and German her heart desires. Learn your state's requirements and laws. Every state has its own laws regarding homeschooling; there are no federal laws regarding it. For instance, in North Carolina, you must first file a "Notice of Intent" to start homeschooling. In this you have to mention if the school is a "private church" school or a "qualified non-public school." The persons providing the education are required to have at least a high school diploma. You have to maintain an annual record of the child's attendance and disease immunization. Every year, the child is required to undergo a standardized test. Each student attending the eleventh grade has to take a nationally standardized test. In other states, such as Oregon, it's as simple as telling the local school district you're going to homeschool and then testing your child at grades 3, 5, 8 and 10. If your child falls below the 15th percentile--meaning, your child tested lower than 85% of all public-schooled kids, pretty hard to do--the child has to be tested again the next year and if he does poorly again may be required to enroll in public school. Lynn Siprelle is behind this whole site.